You will add many Cheats: Faster Research , Allow Ironman Console , Allow Ironman Saves , Energy and many more. Welcome! Below we have reported the Trainer of Stellaris with also attached a small guide to its use. Not only the Trainer! For you there are also the tricks and codes of Stellaris In the appropriate page of the tricks of this game there are paragraphs dedicated to how to cheat with this game, and to unlock unpublished game modes, in addition to the list of Achievements and how to get them. Explore a vast galaxy full of wonder! 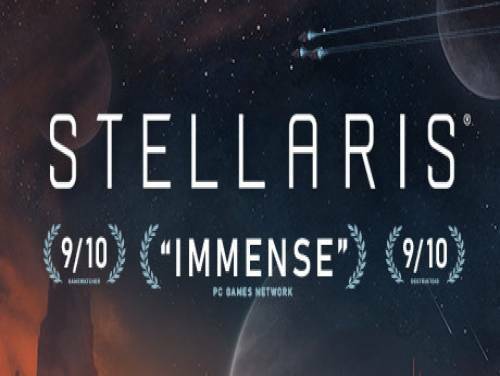 Paradox Development Studio, creator of Crusader Kings and Europa Universalis presents Stellaris, an evolution of the grand strategy genre, with the exploration of space. With deep strategic gameplay, a huge selection of alien races, and a good narrative, Stellaris, you'll explore the universe and get rewarded as a cross, discover, interact with, and learn more about the multitude of species that you will encounter during your journeys. The program you are about to download was not created by Apocanow. However, we have permission to publish and publicize by the authors of the Trainer Stellaris Trainer - v2.2.3 (01.28.2019). The contents of the file are virus free, even if sometimes they can trigger the AV as false positive. Numpad 1: Energy - Pause the game and then press key to add more. Numpad 2: Minerals - Pause the game and then press key to add more. Numpad 3: Influence - Pause the game and then press key to add more. Numpad 4: Physics - Pause the game and then press key to add more. Numpad 5: Society - Pause the game and then press key to add more. Numpad 6: Engineering - Pause the game and then press key to add more. Numpad 0: Instant Build - toggle on and many things complete instantly. on planetary things, they instantly become under your control. Numpad *: Unlimited FTL - toggle on for unlimited faster than light travel. colony will happen in many areas. click very quickly. Make sure the game speed is normal or higher. Numpad +: Unlimited Policy Changes - toggle on to allow easier policy changes. Page Down: Allow Ironman Saves - toggle on and you can save even in ironman mode.